Be the first to share your favorite memory, photo or story of Bernard. This memorial page is dedicated for family, friends and future generations to celebrate the life of their loved one. 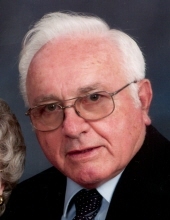 Bernard Edward “Bernie” Lepacek, age 84, a resident of Plainfield, IL since 1969, was born on June 3, 1934 in Joliet, IL. He passed away peacefully on January 20, 2019 at Rosewood Care Center, Joliet, IL. Bernie is survived by his beloved wife of 57 years, Betty (nee Burla); his loving son, Brian (Ed Laginess) of Chicago, IL; and numerous nieces and nephews. His family would like to extend their deepest love and gratitude to his niece Catherine (John) Barrett for their constant support and care throughout Bernie’s 13-year fight with Parkinson’s Disease. He was preceded in death by his parents, John S. and Anna Lepacek; his siblings, Anna (in infancy), Edward (the late Helen), Raymond (the late Rose), Leonard, and Mary (the late John) DeBartolo. A devout Catholic, Bernie has been a parishioner of St. Mary Immaculate Parish for over 50 years, and gave selflessly of his time and talent through various ministries as well as a 3rd Degree Knight of Columbus, Good Shepherd Council #5573. He was a graduate of Joliet Central High School and earned his Associates degree from Joliet Junior College. Bernie served in the U.S. Army from 1956 until 1958. He retired from Argonne National Laboratory in 1995 after 32 years of service. In lieu of flowers, the family would appreciate donations to the Joliet Area Community Hospice, 250 Water Stone Circle, Joliet IL 60431. Visitation will be Wednesday, January 23, 4:00 until 8:00 PM at the Overman-Jones Funeral Home & Cremation Services, corner of Route 30 & 59, Plainfield. The Mass of Christian Burial will be celebrated on Thursday, January 24, 10:30 AM at St. Mary Immaculate Catholic Church, 15629 S. Route 59, Plainfield. Interment will follow at Resurrection Cemetery, Romeoville. To send flowers or a remembrance gift to the family of Bernard E. "Bernie" Lepacek, please visit our Tribute Store. "Email Address" would like to share the life celebration of Bernard E. "Bernie" Lepacek. Click on the "link" to go to share a favorite memory or leave a condolence message for the family.